Not long ago, I added this Belle's Classic boutique into my FB list. Since they having a physical shop just nearby me, why not add them and visit their shop one day. Other than the regular updates I read like New Arrivals and so-and-so celebrity wore their label; recently they running a draw "Giving Away 1 Clothing Each Day" for FREE in conjunction with of 1st anniversary celebration. 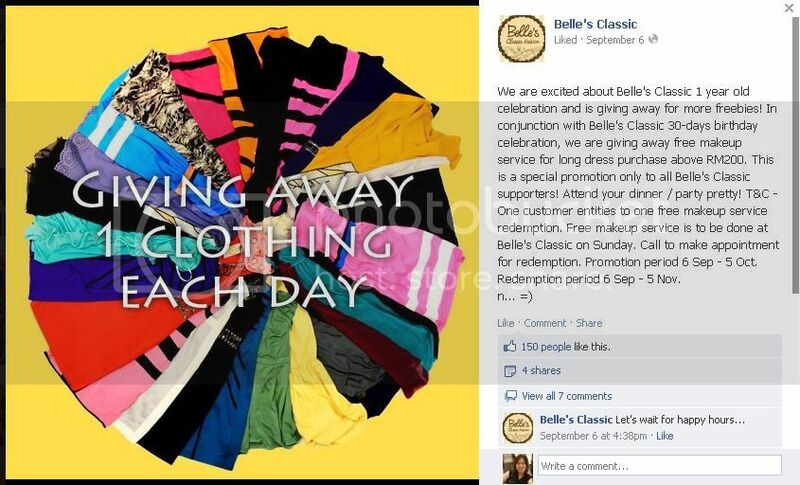 Every day for 30 days (6 Sep - 5 Oct), they will posted up a outfit of the day. 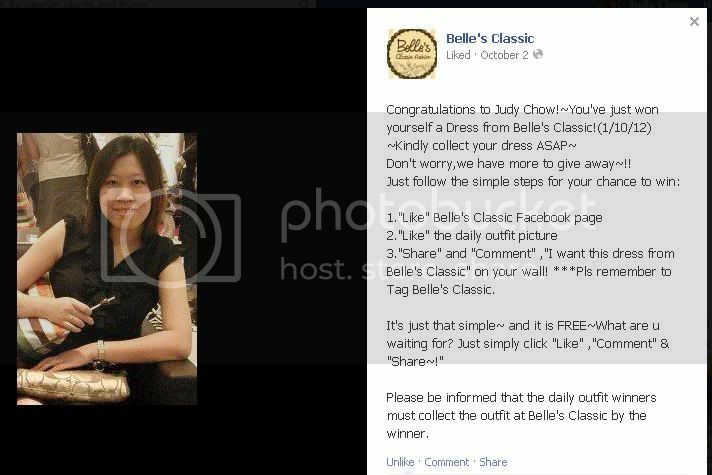 To win it, like the outfit photo and post on your wall "I want this outfit from Belle's Classic". One lucky winner will be selected each day. Here are the 30 days beautiful outfit. Isn't it all very nice piece? I only join in the draw to try my luck 2 times on 20/9 and 1/10 separately (the one circle with red). It is because these 2 dresses I quite like it, for others I'm not much prefer, like those tube dress and those body hugging type I don't think I suitable to wear it anymore. ^^ WOW ^^, can't believe I won the dress I like!!! Dress won on 2nd Oct 2012. Lucky you! The dress is very elegant.